Researchers have validated a new weather prediction model that uses autumn snowfall to predict winter cold in the United States and Europe. When snowfall is high in Siberia, the resulting cold air enhances atmospheric disturbances, which propagate into the upper level of the atmosphere, or stratosphere, warming the polar vortex. When the polar vortex warms, the jet stream is pushed south leading to colder winters across the eastern United States and Europe. 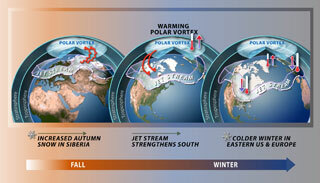 Conversely, under these conditions the Arctic will have a warmer than average winter. Large-scale weather patterns which occur in various locations around the Earth, from the El Niño-Southern Oscillation (ENSO) in the tropics to the high latitude Arctic Oscillation (AO) play a significant part in controlling the weather on a seasonal time scale. Knowing the condition of these atmospheric oscillations in advance would greatly improve long-range weather predictions. Scientists search for clues in the earth’s surface conditions such as tropical sea surface temperatures and snow cover at higher latitudes. Reliable and accurate weather prediction is vitally important in numerous areas of society, particularly agriculture and water management and weather risks are evaluated by a wide range of businesses, including power distributors who make fewer sales during cool summers and more sales during cold winters. The portion of the U.S. economy sensitive to weather conditions is estimated to be at least $3 trillion. The winter of 2002-2003 offers one example of how large-scale patterns can impact a single season. It was supposed to be milder-than-average in the East, driven by the warmer than average sea surface temperatures over the central Pacific during 2002-03 (generated by a strong ENSO event), similar to other recent milder-than-average winters in the northern and eastern United States during other recent El Niño winters. Instead the biting cold of January propelled natural gas prices to an all-time high, and heavy snows paralyzed the transportation infrastructure in all the major eastern cities during February 2003 . The winter of 2003/04 offered little relief to many winter-weary cities in the East with a return to brutally cold temperatures in January. Why have forecasters and businesses been caught by surprise? NSF-funded scientists believe at least part of the answer lies in the frozen tundras of Siberia, where greater-than-average autumn snowfall causes weather patterns in the Arctic regions to shift southward into the midlatitudes during the winter, while less-than-average snowfall causes the patterns to retreat poleward.